Made a nice healthy last night.....BARLEY! 30-50 grams of dried mushrooms (either assorted or mixed). Never a bad idea to have a bunch of dried mushrooms around the house. You can always make extra stock and freeze it. Add 5-6 cups of water to a non reactive pot (stainless) and add to the burner. Add the dried mushrooms and a quarter wedge of the yellow onion and some salt and pepper. Bring to a boil then turn the heat down to a simmer and continue to simmer for 25-30 min. Dice the remaining yellow onion. Chop 2 cloves of garlic and add both the onion and the garlic to a pot or deep dish pan. Add a TBS of butter and 2 splashes of olive oil and bring to a simmer. Sauté the onions and garlic until soft making sure not to brown the ingredients. If they start to brown, either add a splash of white wine to the onions and deglaze or remove the onions from the heat until the stock is done. 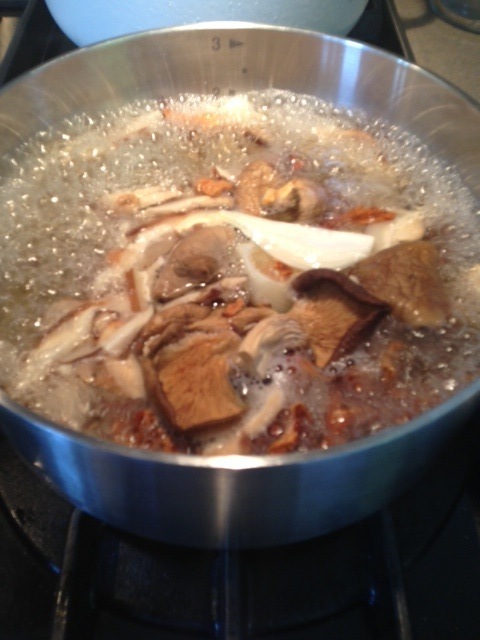 after 30 minutes, strain the mushrooms out of the stock leaving just a clean mushroom stock. Add 1-1.5 cups of barley to the sautéd onions and garlic and stir in. One ladle at a time, add warm mushroom stock to the barley. Stir with a wooden spoon until the stock has almost evaporated. Keep doing this for 15-20 minutes then add your diced mushrooms. Continue to add stock one ladle at a time until the barley is al dente or to your liking. Should take close to 30-40 minutes or so to cook. If you're unsure of when it's done, keep tasting it. When it is to your liking, add one more ladle of stock and 1 big handful of grated parmesan, salt and pepper, stire and serve. Chopped the kale and sauté in a hot pan with some olive oil and salt and pepper. 3 minutes or so. Add some salt and pepper and top the barley with Kale and a shaving of parmesan cheese.